As a means of readily detecting the presence of minerals in their ores the blow-pipe, in the hands of a skillful operator, is unrivaled. Nor is this skill at all hard to come by; two or three weeks' patient study under a good master should teach a great deal, and subsequently proficiency would come by practice in the field. 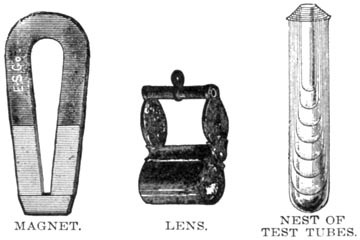 Unfortunately, some very clever men have become so enthusiastic as to blow-pipe work that they have devised methods by which the amount of metal in an ore as well as its nature may be determined, but in so doing have so enlarged the amount of apparatus, and complicated the tests so seriously that the simplicity of the blow-pipe outfit is in danger of being lost, and its chief advantage of being forgotten; for there are many better ways of determining the value of an ore. A good assay or, better still, a mill run, is worth incomparably more than any quantitative blow-pipe test, even when conducted by a Plattner. The chemical blow-pipe is made of brass or German silver, with platinum tip. The best fuel, taking everything into consideration, is a paraffin candle in cold climates, and a stearine candle in hot ones. Tallow may do in an emergency, but it requires too much snuffing. 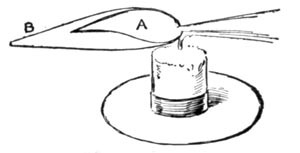 The blow-pipe can produce two flames. The one known as the reducing flame, and generally printed as R.F. ; and the oxidizing flame, represented by the initials O.F. In the first the substance under examination is heated out of contact with the air and parts with its oxygen. In the second, it is heated in the air and absorbs oxygen. Well-burnt pine or willow charcoal in slabs 3 inches by 1-3/4 inches is the material upon which the mineral to be tested is placed. A small shallow depression is scraped out of one side of it and the assay placed therein. Platinum wire, some 3 inches long, conveniently fused into a piece of glass tube as a handle, is used to test the coloration of minerals in the flame. This should be cleaned occasionally in dilute sulphuric acid and then washed in water. A small pair of forceps with platinum points serve a great variety of purposes, but the beginner must be careful not to heat metallic substances in them to a red heat, as he may thereby cause an alloy of the metal with the platinum and spoil them for future use. Glass tubing one-twelfth to one-quarter inch in diameter and from four to six inches in length is used for a variety of purposes. From this material what are known as closed tubes may be made by heating a piece of the tubing at or about its center over a spirit lamp, and, when the glass has fused, pulling it apart. These closed tubes are used in heating substances out of contact with the air. A small agate mortar is indispensable. It must be used for grinding substances softer than itself to a powder, but it will break if rapped sharply. 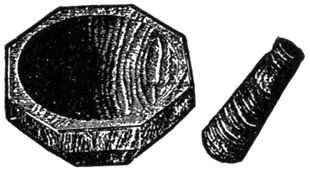 A small jeweler's hammer is used to flatten metallic globules upon any hard surface A regular blow-pipe outfit would include a small anvil for this purpose, but it is hardly necessary, as any iron or steel surface will do. A magnet will detect the presence of any magnetic mineral, especially if it is reduced to powder and the test made under water. Two small files, one three-cornered and the other rat-tailed, must be included in the list of requisites. By means of the former, glass tubing may be notched and pulled or pushed apart, and the latter is necessary in fitting glass tubing to the cork of wash-bottles and other apparatus. A good lens is indispensable. That known as the Coddington is as good as any. A dozen test tubes of hard glass, with stand, in small and medium sizes, should not be forgotten. 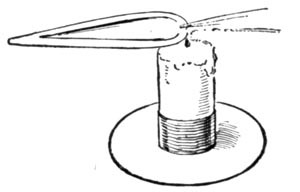 A glass funnel 2-1/2 inches in diameter is requisite in filtering. The circular filter papers are folded in four and placed in the funnel, point down, three thicknesses of the paper being on one side of the funnel and one thickness on the other. A wash-bottle is made from a flask into which a sound cork has been placed with holes in it for two pieces of glass tubing. The one serves as a mouth-piece into which the operator blows, while the other, reaching almost to the bottom of the bottle and ending in a spout outside the cork, permits a stream of water to be forced out of the bottle when it is blown into. A few glass rods in short lengths do for stirrers. A little ingenuity is better than much apparatus. Of reagents, all those to be found in a well-appointed laboratory may occasionally be of service, but the rough and ready prospector can get along fairly well with the following: Carbonate of soda, borax, microcosmic salt, cobalt solution, cyanide of potassium, lead granulated, bone ash, test papers of blue litmus and turmeric, the former for proving the presence of acid in a solution and the latter that of an alkali. The foregoing are all dry reagents. Among the wet reagents are: Water--clean rainwater--or, better still, distilled water; hydrochloric acid, sulphuric acid, nitric acid, ammonia, nitrate of cobalt. Lead. White, malleable. Red when hot, yellow when cold. Bismuth. White, brittle. Red when hot, yellow when cold. Zinc. None. Yellow when hot, white when cold. Antimony. White, brittle, fumes. White. Red or yellow, hot. Bottle-green. Iron. Blue, hot or cold. Blue. Cobalt. Green, hot; blue, cold. Red. Copper. Violet, hot; red-brown, cold. Gray. Nickel. Antimony. Place the mineral in the cavity with a little of carbonate of soda, and blow upon it with the inner or oxidizing flame. This is formed by inserting the blow-pipe an eighth of an inch into the flame and blowing steadily. A white incrustation on the coal, and a brittle button of antimony should be the result. Lead. Treat the suspected lead ore the same way, and you will get a yellow incrustation on the coal and a button of malleable lead. Zinc. Proceed as above, and after blowing for a few seconds moisten the incrustation with a drop of nitrate of cobalt. Heat once more, but this time use the outer or reducing flame, which is produced by keeping the point of the blow-pipe a little outside the flame and blowing more gently than before, so that the whole flame playing upon the coal may be yellow in color. A green incrustation will be an evidence of zinc. Copper. As usual, mix the ore and the soda into a paste and fuse it with the oxidizing flame. Dig the mass out of the charcoal with the point of a knife and rub it in the mortar with water. Now decant into a test tube, and, allowing the sediment to settle, pour off the water. If there was copper in the ore, red scales will be found in the test tube. Arsenic. Heat in the inner flame for a second or two, and if the ore contains arsenic you will notice an odor of garlic. Tin. This is a very difficult ore to reduce, but the addition of a little cyanide of potash to the powdered ore will make it easier. Fuse, after moistening on the charcoal, in the oxidizing flame, and you will probably obtain small globules of tin. Silver. Make a paste of the ore with carbonate of soda; add a small piece of lead and fuse into a button. Make a second paste of bone ash and water, and after you have dried it with a gentle flame place the button of silver and lead on the bone ash, and turn on the oxidizing flame. The lead will disappear, leaving a silver globule. Should it not be pure white, but more or less tinged with yellow, it probably contains gold; and if the button be dissolved in nitric acid, whatever remains behind is gold. Sometimes it is desirable to determine whether tellurium is present in an ore. This is very easy to find out. All that is required is a blow-pipe, alcohol lamp and a porcelain dish. Break off a small piece of the ore, place it in the dish previously warmed, blow upon the ore with the blow-pipe until it is oxidized, then drop a little sulphuric acid on the ore and dish. If tellurium be present, carmine and purple colors on the assay will proclaim the fact. Bismuth ores are very heavy; usually they have more or less antimony associated with them, which is a drawback, as the separation is an expensive matter and the returns are less than they would be from a low grade pure ore. In testing for this metal, dissolve a crushed sample in nitric acid and then add potash in excess. If the ore is one containing bismuth, you should have a white precipitate; if it contains cobalt, you will get a bluish-green coloration. Bismuth is worth about fifty cents a pound if pure and free from antimony. Galena is often mistaken for other ores, specular iron ore for instance. If the ore be crushed and heated in nitric acid until dissolved, some water added, and an addition made to the solution of a few drops of ferrocyanide of potassium, a dark blood-red precipitate is thrown down. If the ore were galena, there would be no coloration. The so-called steel galena which carries a little zinc is generally richer in silver than the ordinary cube galena, though the reverse is sometimes the case. If lead ore be dissolved in nitric acid, the solution diluted, and some hydrochloric acid added, a white precipitate is thrown down. Add ammonia and the precipitate remains unaltered. The blow-pipe operator has to learn to breathe and blow at the same time; the breathing he does through the nostrils, the blowing is produced by the natural tendency of the cheeks to collapse when distended with air. A skillful operator can blow for many minutes at a time without the slightest fatigue. To identify cinnabar, the ore from which quicksilver is obtained, make a paste of the substance in powder and carbonate of soda. Heat in the open tube, and a globule of mercury will result. Sulphur turns silver black. Make a paste with carbonate of soda, heat on the charcoal, and removing the mass with the point of a knife lay it on a silver coin and moisten. A black sulphide of silver should show quickly on the coin if sulphur is present. Magnesia gives a faint pink color when heated and treated with nitrate of cobalt on coal. Alumina under the same circumstances give a blue color. Roasting is an oxidizing process, the substance being heated in air, so that it may absorb oxygen. The test by reduction with soda on coal in the R.F. is particularly valuable in the case of copper ore, as little as 1 per cent. being detected.